Global demand for siding is forecast to rise 2.8% annually through 2022 to 6.7 billion square meters, valued at $78.6 billion. Going forward, demand for siding products will be driven by increases in nonresidential building construction spending, especially in China, and an acceleration in the global rate of growth in new housing construction. Through 2022, the Asia/Pacific region will account for the majority of global siding demand growth, with China accounting for the largest share of these gains. Above average growth in nonresidential building construction spending will boost product sales, as such structures as offices, retail establishments, and healthcare facilities use siding, even in poorer developing countries. Additionally, many Asia/Pacific countries have massive housing stocks, a large number of which have only load-bearing walls and use no siding materials. As standards of living and personal incomes rise in many parts of the region, more homes will be outfitted with siding to increase the aesthetic appeal and durability of the structure, providing a substantial boost to siding demand. However, siding demand will be restrained by below average market growth in many developed countries. In addition to posting subpar construction spending gains through 2022, virtually all buildings in developed countries are already sided. Brick and tile will continue to account for the largest share of siding demand through 2022. The product is commonly used in every region in the world. In developing countries, brick and tile are popular because widespread raw material availability allows low cost versions of these products to be easily produced. In the United States, South Korea, and many countries in Western Europe, the aesthetic appeal of brick contributes to its use in the residential market. Stucco and EIFS demand will account for the second largest share of siding demand in area terms in 2022. Stucco is the least expensive of any major siding product, and will be a popular choice for many of the developing countries where buildings are using siding for the first time. Concrete and stone siding is expected to increase its share of the siding market despite its higher cost because of the durability of the product. 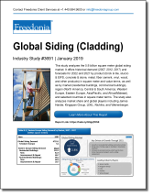 This Freedonia study analyzes the global siding (cladding) industry. It presents historical demand (2007, 2012, 2017) and forecasts for 2022 and 2027 by product (brick and tile, stucco and EIFS, concrete & stone, metal, fiber cement, vinyl, wood, and other products) in square meters and US dollars, and by market (residential buildings and nonresidential buildings) and region (North America, Central and South America, Western Europe, Eastern Europe, Asia/Pacific, and Africa/Mideast) in square meters. Siding demand by product and market are provided for 20 countries, and total siding demand is provided for an additional 13 countries. In addition, the study analyzes company market share for companies such as James Hardie, Kingspan Group, Nichiha, Wienerberger, and others.